Icy party kingdom, or magical evening escape? Choose elegance, every time, with these beautiful icicle lights. 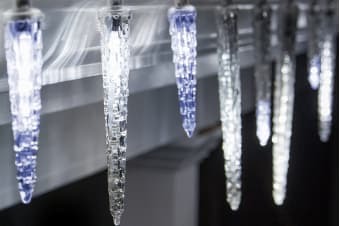 These Solar Icicle Show Lights take the form of captivating icicles, with light flowing through their lengths like shooting stars. Elevate your next gathering, or brighten up a cosy evening at home, with this stunning light display. Each blue and white icicle offers brilliant radiance, with a huge 3.5 metres of distance. These stunning, modern lights are fuelled by an entirely natural source – our own sun. Enjoy up to eight hours of magical lighting effects, without hurting the environment. Powerful lighting displays don’t have to mean exorbitant electricity bills. These decorative lighting sets contain fully-rechargeable, solar-powered batteries. Enjoy vivid lighting without the power plugs.